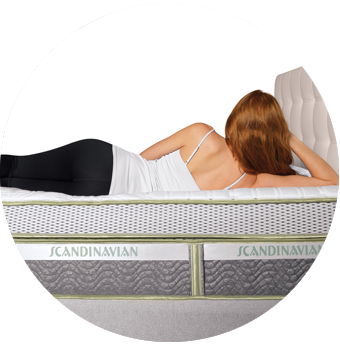 All American Mattress is your headquarters for the Scandinavian Sleep System. It is impossible to put a price on unparalleled comfort. To quote a recent Scandinavian Sleep System's owner, "You can't really put a price tag on a wonderful night's sleep. But physical and mental well being are directly correlated to the quality of your sleep, therefore it is obvious that purchasing the right mattress is an important decision. "Let's begin the journey to understanding just what exactly sets this mattress apart from all other mattresses. First, the outer layer is made of the finest cotton infused with bamboo fibers for extra durability. This cover holds up to wear and tear. It looks "top-notch" because it is exactly that. This cover does more than just hold the layers together; it gently greets your skin and welcomes you into a relaxation state. Second, the quilted "Strataflex Layers" are comprised of a particular type of high-resiliency foam. This foam is engineered to prevent body impressions or other shortfalls of lesser mattresses. These layers not only provide support for the user but they also provide protection for the more delicate memory foam layers beneath. 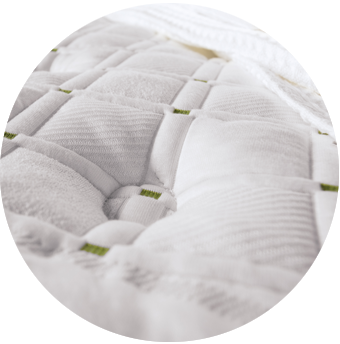 The "Strataflex Layers" provide a buffer to the memory foam so that you fully enjoy the benefits of the memory foam layer without leaving a permanent impression on them. Third, this is the true treasure to any modern sleep system: The Memory Foam Layers. These layers provide your body with the exact support to prevent uncomfortable nights of tossing and turning by supporting key points on your body that cause stress. These points are the pressure points and joints of our bodies. You can actually feel the memory foam layers shifting and adapting to your unique shape when you first lay on the mattress. It is a "one of a kind" experience. You simply cannot go back to an ordinary mattress after experiencing the multiple layers of memory foam in this mattress. They provide multiple layers to allow a "zero-gravity" sensation to allow spinal decompression and a more restful night's sleep. Next, is the "Luratex Foam Core" and the Foam base. This specific type of foam is durable, strong and dense. It is designed to replace the less adequate latex cores used by other mattress brands. This specifically designed foam core allows for longevity and continued enjoyment out of your Sandmahn mattress. Also at this level is the Foam base which is an ingenious designation of special foam types to provide the necessary support for the core of your mattress. This again helps to extend the lifespan of your mattress and ensure that you and your loved ones are blessed with a luxurious night's sleep, each and every night. Finally, the ventilation eyelets and the "Scandinavian LifeTime Foundation" ensure that while you are enjoying your mattress and sleeping peacefully that your mattress is well taken care of by proper ventilation to these internal layers and a steady foundation. If you are tired of searching for the answer to a good night's rest, then look no further. All American Mattress has your solution.